Formula 1's Australian season-opener is one of five grands prix that will start an hour earlier in 2015 following recommendations made after Jules Bianchi's crash in Japan last October. The Marussia driver, 25, crashed into a recovery vehicle in wet and dull conditions. A subsequent report advised races should not start within four hours of dusk or sunset to avoid similar light. The races in Malaysia, China, Japan and Russia have also been brought forward. The 2015 race in Suzuka will now start at 14:00 local time (05:00 GMT). The accident panel - set up by governing body the FIA - said there would be no changes to the times of the night races. F1 has floodlit races in Singapore, Abu Dhabi and Bahrain and the trend has been for later starts in Asia to boost television viewing figures in Europe. Malaysian circuit boss Razlan Razali said last week he would welcome an earlier start for a race that has been affected by late afternoon tropical downpours in the past. 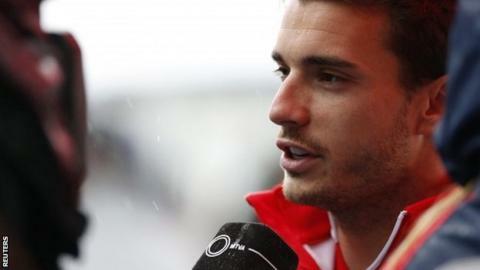 Bianchi, whose crash happened in wet conditions which affected the light, is breathing unaided after coming out of a coma, but remains unconscious.